After Double Fine's Adventure received massive response from gamers all around the world, another interesting game Code Hero is now making lots of news. 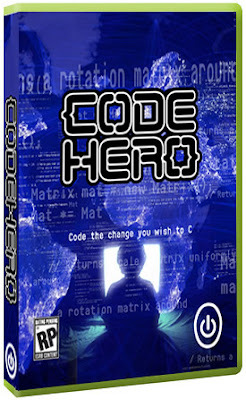 Code hero gives players unprecedented power inside the game. It's a new type of learning; players start out using powerful code without needing to understand it, then slowly master that code to conquer specific challenges. It's a game first, and a learning tool second. Code Hero is currently on Kickstarter and has already reached is target of $100K. Those who pledged will get beta access to the game. The game is based on Unity3D engine which is not supported on Linux. However, latest release of Unity3D engine has brought support for exporting games to Google Native Client (NaCl) that allows us to play 3D games on Linux (via Chrome web browser). The developers are looking to deliver Linux support via NaCl. We're big fans of Linux ourselves. Actually there is now Native Client support for Unity in the latest 3.5 Beta. We plan to deliver Linux support as soon as we can based on that. So, in current form the game is not available for Linux. If you are thinking to pledge, I would recommend waiting for NaCl version to come out. Gamasutra has interviewed Alex Peake, who is making the game. He said that there will be more programming languages. Alex Peake has said that in advanced stages of the game, Code Hero players will have to go as far as compiling a Linux Kernel. Then it will get really intense: We've got a prototype that puts Code Hero players into direct control of VMWARE-based Linux operating systems, so we can incorporate complete full-stack operating system coding of all types down to modding and compiling kernals in-game. You can imagine the implications if we were crazy enough to demo something like that at the most recent Chaos Communications Congress with kids running tools like Backtrack and Metasploit... Hacking the full stack in-game will be necessary to produce Real Engineers with the kind of computer science it takes to do more than just get by on a surface knowledge of a single API or language.